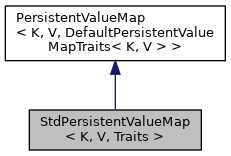 A map that uses UniquePersistent as value and std::map as the backing implementation. Persistents are held non-weak. C++11 embedders don't need this class, as they can use UniquePersistent directly in std containers. Definition at line 362 of file v8-util.h. Definition at line 364 of file v8-util.h.